Can you drag a moose carcass (safely) across a lake? This moose was just floated across the lake. 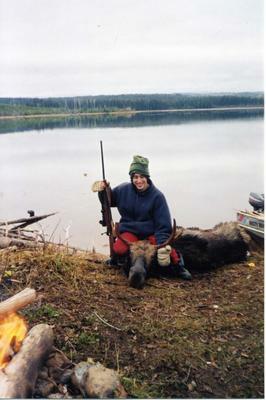 This is something we were discussing about after we loaded the moose in the boat to bring it back to the camp. Is it safe to drag the moose over the water? How long would they stay afloat before sinking? I have successfully floated moose across a lake (uncleaned). The hair and air within a moose will keep it afloat for some time as long as the entrails are intact. Moose are quite buoyant until field dressed. You can tow it easily with a motorboat. We towed our moose across a lake (about a kilometer) with a 12 foot aluminum boat and a 10hp motor. The moose will float in about 2 feet of water. Safely tow a moose across a lake? I wouldn't think it would be a problem. Even if the moose was beginning to loose it's buoyancy I don't think it would sink instantly and as long as you were moving the animal would stay near the surface. As for just how long a moose will float, I can't answer that one. Hours for sure... days I don't know.